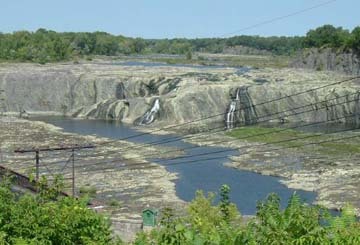 Cohoes Falls was a major barrier to commerce moving west on the Mohawk River. This problem was solved with the construction of the Erie Canal around the falls. Hydro power from the Cohoes Falls were used to power textile factories, and they generate electricity today (which is why most of the river bed is dry). 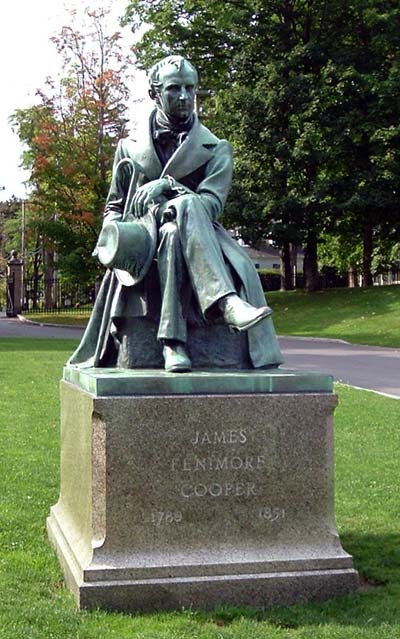 James Fenimore Cooper statue in the center of the village that bears his family name. One of his favorite novels, Glimmerglass, takes place on nearby Otsego Lake. 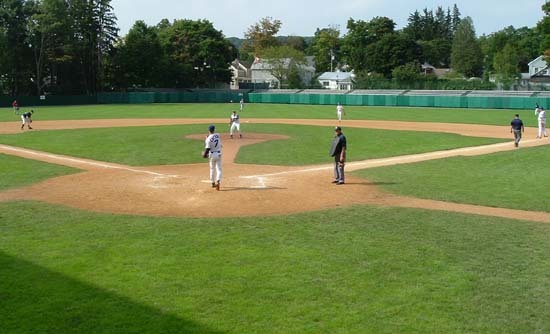 Of couse, Cooperstown is most commonly associated with baseball, but the village easily predates the National Pastime. New York's Capital and Mohawk Region sits at the "hub" of the state. It is here that water transportation (and rail and superhighways) turns from northward to westward. It was here that the Dutch established Fort Orange in 1624 several years before they made that infamous purchase of Manhattan Island for $24. This is where the Hudson River is no longer navigable for large ships, i.e. it is a "normal" river, not an estuary as it is to the south of here. And, of course, flowing in from the west is the Mohawk River, with its many rapids and waterfalls. 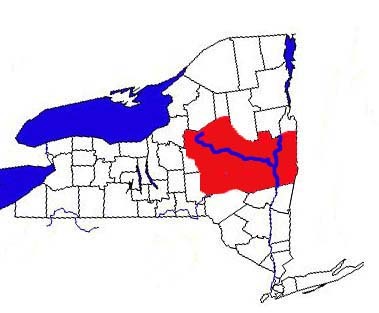 It should not be surprising that many of New York's oldest communities developed here, from Rome and Utica in the west to Little Falls, Canajoharie, Amsterdam on the Mohawk itself, and the triple cities of Albany, Schenectady, and Troy near the confluence of the two rivers. The first residents of this region, the Mohawk Nation (one of the Six Nations of the Haudenosaunee), knew the stategic significance of this country. It led to the Fur Belt of the Great Lakes and beyond. Many wars in the 17th and 18th centuries were fought over the Mohawk Valley. It was also a battleground between the French and English (who took the colony from the Dutch in 1664). Then it was the target of General Burgoyne's invasion from Canada during the American Revolution. It was his defeat in nearby Saratoga that changed the course of the war (and world history, too). Immigrants from all over Europe moved into the Mohawk Valley before the Revolution. The fertile land near the river, a left-over from the last Ice Age, encouraged settlement. The Native population was not thrilled about this incursion into their homeland, and this was the scene of very bloody conflict in the late 18th century. But after the American victory, the Mohawk and Oneida peoples of the valley were forced into reservations in other parts of the state, or in Canada. More settlers moved into the vacuum, especially from New England. Transportation remained a problem. Even though the Mohawk River is only a few hundred feet above sea level, a ribbon of green on relief maps between the Adirondacks and the Catskills, it still has its barriers. The solution, of course, was the construction of the Erie Canal from 1817 to 1825. The original canal (known commonly as "Clinton's Ditch") paralleled the Mohawk River from Rome to Albany. There were serious engineering problems that needed to be overcome. One was at Little Falls, where the Mohawk is forced through a narrow channel and a drop of over forty feet. At Schoharie Crossing and at Rexford the canal had to be "bridged" over the river by aqueducts, the ruins of which still remain today. The most challenging obstacle, however was the falls at Cohoes. Between Schenectady and Albany there were 33 locks to circumvent this barrier. The canal was an instant success. Albany was the eastern terminus of the canal where it joined the Hudson. Most of the nation's commerce from the west came through Albany. Other cities and towns used the water power from the Mohawk and became part of America's first industrial complex. 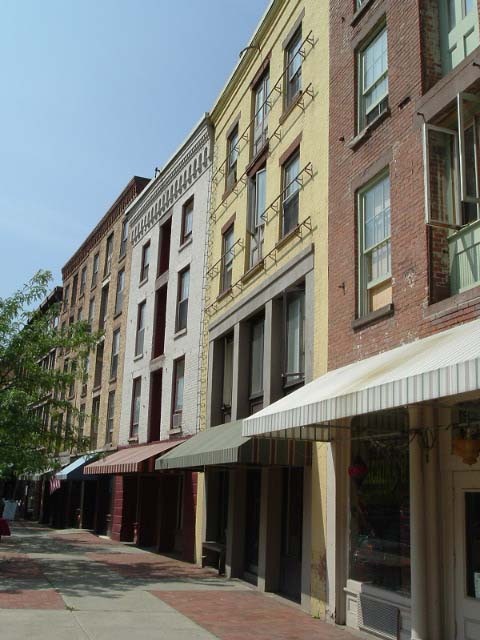 Rugs were made in Amsterdam, shirt collars in Troy, and Schenectady became the "Electric City". Unfortunately, most of these industries are no longer in existance, and the Mohawk-Capital Region suffers from declining population and unemployment. Many towns look like they never got out of the 19th century. (This old world look is now being exploited for tourism in several historic districts). 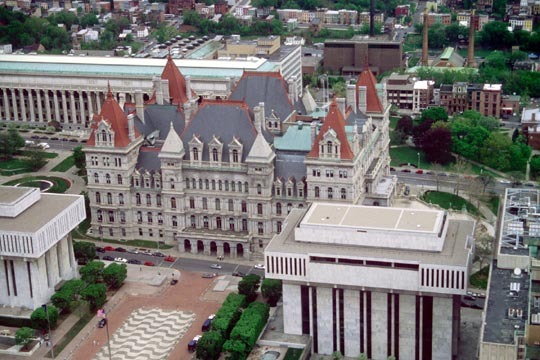 Much of the economy today is centered around government, since Albany is the state capital. Many of the residents of the lower Mohawk Valley either work for the state bureaucracy, or they are in businesses depending on it. Even though the industrial base has declined, it is still in existence, creating an interesting mixture of abandoned buildings and working factories. We should not dismiss the Capital and Mohawk Region as just another part of the "Rust Belt." As the Pathway West, its significance to development of New York State and much of the rest of the nation needs more emphasis. This is not just a statement of the past, but our present and future, also. This will be the center of our focus as we tour the region. If you are going to travel through the Capital-Mohawk Region, then follow this link to find out "What You Should See."